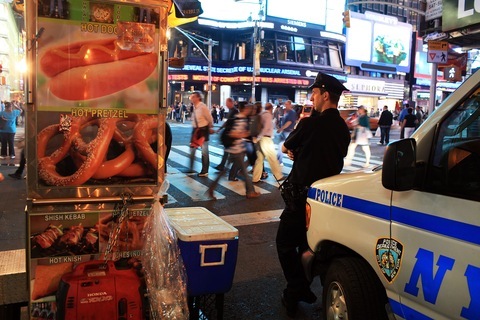 A New York City police officer stands watch Monday night in Times Square. Photo by Spencer Platt/Getty Images. Federal agents have arrested a naturalized U.S. citizen from Pakistan in connection to the failed attempt last weekend to detonate a car bomb in New York’s Times Square. The man, Faisal Shahzad, was apprehended shortly before midnight on Monday at John F. Kennedy International Airport on board an Emirates airline flight to Dubai. “The investigation is ongoing, as are our attempts to gather useful intelligence, and we continue to pursue a number of leads,” Attorney General Eric Holder said at an early morning press conference Tuesday. “But it’s clear that the intent behind this terrorist act was to kill Americans,” Holder added. Authorities said Shahzad, 30, is believed to have paid cash for the green Nissan Pathfinder that was discovered Saturday packed with gasoline, propane, fireworks and non-explosive fertilizer. What remains unclear is whether Shahzad, who had been living in Connecticut, or any potential co-conspirators had any links to foreign terrorist groups such as al-Qaida. By Monday, though, an FBI-led Joint Terrorism Task Force had taken over the investigation, the Washington Post reported. “As we move forward, we will focus on not just holding those responsible for it accountable, but also on obtaining any intelligence about terrorist organizations overseas,” Holder said. The initial investigation had been focused on a man captured on a security camera changing his shirt near the scene of the attempted bombing. It shifted Monday after authorities located the previous owner of the vehicle in Bridgeport, Connecticut. The former owner told investigators a man of Middle Eastern or Hispanic descent purchased the Pathfinder in cash for $1,300 about a week ago. FBI agents searched the home at a known address for Shahzad in Bridgeport early Tuesday, the Associated Press reported. Authorities removed filled plastic bags from the house as local police and FBI agents gathered in the cordoned-off street. Shahzad is expected to be formally charged in Manhattan later Tuesday. We’ll have lots more as information into the investigation continues to come out. Stay tuned. Communities up and down the Gulf Coast on Tuesday are watching and waiting to see when oil may reach their shores from the spill caused after the sinking of a BP drilling rig two weeks ago. Meantime, BP late Monday made progress in its effort to contain the spill, completing one of three dome-like structures that will be lowered over the leak to funnel oil to a ship. Also on Monday, three U.S. senators “introduced legislation that would increase the cap on oil company liability for economic damages from $75 million to $10 billion,” the Times-Picayune reported.